It is with great sadness that we announce news that we found out this past Friday morning. CBC has cancelled Arctic Air, a dramatic series starring Adam Beach and Pascale Hutton. 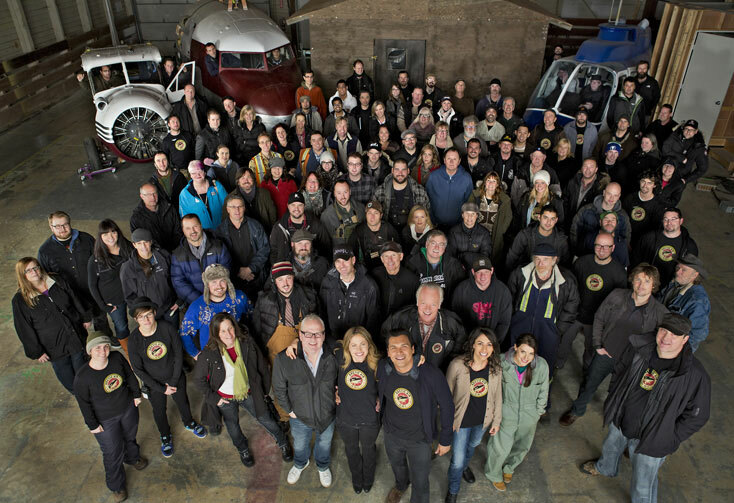 The series, which featured a family-run bush pilot charter plane service based in Yellowknife, is coming to an end after three eventful seasons. While there was some location shooting done in the Northwest Territories, the majority of the shooting was actually done around the Lower Mainland, with the show’s main sound stage located in Aldergrove, where the show also made use of the local Best Western Hotel, the Aldergrove branch of the Royal Canadian Legion and other properties. Arctic Air had become a fixture here, as well as at the Langley, Boundary Bay and Pitt Meadows Municipal Airports. As the official mover of “Adam’s plane” the company Scott and I work for to pay the bills, one of that company’s trucks is now moving the Beaver for the final time, returning it to its owner. Due to the nature in which I found out the show had been cancelled, I wanted to get an official statement from CBC and Omni Films. According to a representative from CBC’s PR department, the network will not be issuing an official statement or reason for the show’s cancellation. I have not yet heard anything from Omni. As fans of Canadian-made film and television, and supporters of the artisans who create the stories we love to watch, we are saddened to see yet another Canadian drama fading to black. Arctic Air is one of the few shows that managed to successfully launch a social media component, with fans being able to interact with the stars during live Tweet sessions. On the Arctic Air site, fans can also enter the VIP Lounge where they can get more behind the scenes access. Arctic Air’s official facebook page has 20 300 Likes – and already the fans are upset as word gets out that Arctic Air is closing up shop. The series and its stars have also been nominated for several awards within the Canadian film and television industry, with writer Susin Nielsen winning a Leo Award in 2012 for Best Screenwriting in a Dramatic Series. Not too long ago, CBC and Netflix announced a new partnership that would see many of the CBC’s shows offered on the digital service. Arctic Air was not one of them. Despite this, Arctic Air has found a following through the torrent world – and while I don’t condone piracy, it is something that occurs regularly in our digital world. The show has a 6.8/10 on IMDB, with fans from the UK and USA posting positive reviews – not unlike the unmeasured global popularity of the Showcase series Endgame, which was also unexpectedly cancelled. In this age of digital access, I truly do not understand why networks are not taking full advantage of the opportunity to shop their titles around the world, making them legally available to anyone who wants to watch – and pay – just as those who have Netflix or Hulu do. While Arctic Air – or many CBC shows outside of Hockey Night In Canada – has not consistently cracked the weekly Top 30 ratings released by BBM, I don’t put much stock in the way ratings are measured or their meaning, because in looking through several months’ worth of charts, I find it hard to believe that Reign, Game of Thrones, Vikings or The Borgias weren’t in the Top 10 at the very least, yet they appear nowhere, so which “national networks and Canadian English specialty networks” are measured? Discovery’s Highway Thru Hell apparently broke all kinds of records when it first debuted in September 2012, yet it too is missing from the ratings chart. Back in May 2012, a CBC press release I received opened with “Building on one of its most successful seasons ever, CBC has unveiled its 2012-13 broadcast season. Anchored by a roster of strong, proven, made-in-Canada programs across all platforms, the public broadcaster is celebrating its successes while continuing to move forward on its strategic plan to serve Canadians in dynamic new ways.” And then the budget cuts happened. CBC was told to trim 115 million dollars from its budget by the Federal government, and we are now entering the deadline time period for those cuts. Is Arctic Air the first casualty of this final reach for austerity on the CBC’s part? If so, what the government has forced upon the CBC is going to put a rather large hole in our Canadian culture as far as home-grown series are concerned. With these budget cuts, we are going to see fewer new shows getting the greenlight for production with CBC unless some new funding model can be implemented to support the network, because many tax payers feel that we should not be supporting a national public broadcaster. I disagree, but then I am an avid supporter of the creative industries and would rather see my tax dollars go to support those industries and the fan-out economic effect their productions have on our communities than go to pay a bunch of senators outrageous salaries for the rest of their lives. I am hoping that there will be some type of backlash when word of Arctic Air’s cancellation gets out. I hope that there will be a “Save Arctic Air” movement like there was for Endgame – we were a part of that movement, and it came so close to being picked up again. It is my hope that we hear from Omni and they will support such a movement. Granted, many of Arctic Air’s stars have other irons in the fire – Adam Beach is certainly a busy guy, and others such as Stephen Lobo, John Reardon and Lexa Doig (among others) have roles on Showcase’s Continuum – we still want to watch Arctic Air for many seasons yet. The story was just starting to expand, what with the airline winning the SARS contract, opening the door for many more interesting plots and situations that will now disappear as Arctic Air flies off across the horizon. If we can’t bring back this quality Canadian-made prime time drama, please don’t let it be replaced by more of the “reality show” drivel that has permeated our airwaves. We’ll take solid writing, strong characters and a good plot twist over “reality drama” any day of the week. Save Arctic Air Facebook Group – please join and help us get Arctic Air flying again. This entry was posted on Monday, March 17th, 2014 at 10:28 am and is filed under Editorials, National News. You can follow any responses to this entry through the RSS 2.0 feed. You can leave a response, or trackback from your own site.